Cutting Edge Cinema Technology for the next generation of Feature Film Production and Exhibition. The SDS-70 IMPACT projector is a digitally controlled advanced definition 5 perf. 70mm large format display system. The precision digital cine-max transport provides for rock-steady images, no jump or weave on any size screen. There is no significant film wear because there isn't a film trap mechanism on the projector to cause excessive friction and no part of the SDS-70 IMPACT projection system comes in contact with the picture area. Due to the design of the digital cine-max transport, picture quality is maintained from first show to last show. More than 2000 presentations are not unusual. In addition, the 48fps. SDS-70 frame rate is digitally optimized so that each frame is refreshed twice, resulting in a display rate of 96 images per second, a similar refresh rate employed by computer displays. At 96 displays per second there is no flicker and image brightness is theoretically unlimited. The SDS-70 IMPACT projector is digitally linked with the 70mm "short turn around" platter for optimum speed and "pay out" control. 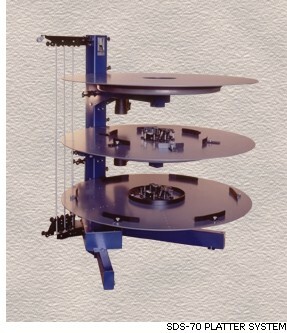 The platter can accommodate two complete feature films with more than two hours and twenty minutes of uninterrupted playing time. To complete the system a digital audio reproducer incorporating eight uncompressed channels of state of the art sound reproduction is utilized.